This page shows a list of events being held to mark Augustus’ bimillennium in (or around) 2014. If you know about or are planning an event which is not listed here, get in touch and I will gladly add it. 19th August 2014 – Evening debate at Macquarie University: Judging Augustus. 29th September to 2nd October 2014 – Conference at the University of Sydney: Augustus from a Distance. 27th May to 21st September 2014 – mini-exhibition at the Kunsthistorische Museum, Vienna: Väter Europas: Augustus und Karl der Große (Fathers of Europe: Augustus and Charlemagne). 6th to 7th November 2014 – Conference: Auguste à travers les âges: réceptions, relectures et appropriations de la figure du premier empereur romain (Augustus through the Ages: receptions, readings and appropriations of the historical figure of the first Roman emperor). Details and CFP available here in English. 23rd September 2014 – Opening of the Bosnian-Herzegovinian part of the Keys to Rome project at Sarajevo City Hall Vijećnica. 22nd to 26th September 2014 – Conference in Zagreb: Stoljeće hrabrih: Arheologija rimskog osvajanja i otpora starosjedilaca u Iliriku za vrijeme Augusta i njegovih nasljednika (The Century of the brave: Archaeology of the Roman conquest and indigenous resistance in Illyricum during the time of Augustus and his heirs): call for papers and registration details; programme and abstracts. 21st June 2014 – Family activity day in Prague: Dies Romanus. Liboc archaeological park. 23rd September 2014 – Opening of the Egyptian part of the Keys to Rome project at the New Library of Alexandria. 11th September 2014 – 11:00 – 11:45am, talk by Professor Teivas Oksala as part of the Athenis Finlandiae festival: “A decree went out from Caesar Augustus” Pax Augusta – Peace of Augustus. The opening ceremony which follows also includes a declaration of peace by Prof. Oksala in honour of Augustus’ bimillennium, and a sung performance of Finlandia by Jean Sibelius in Latin by Professor Jukka Ammondt with new lyrics that declare world peace. 19th March to 13th July 2014 – Exhibition at the Grand Palais in Paris: Moi, Auguste, Empereur de Rome (I, Augustus, Emperor of Rome). This exhibition is a remount of the materials previously displayed at the Scuderie del Quirinale in Rome in the exhibition Augusto. It is supported by a programme of workshops, guided visits, film screenings and lectures. 17th-18th May 2014 – Shows and guided visits at the amphitheatre in Nîmes: Les grands jeux Romains: l’avènement d’Auguste (The Great Roman Games: the arrival of Augustus). 6th June 2014 – Colloquium at the Université Sorbonne Nouvelle – Paris 3: Au miroir de la postérité : l’Empereur Auguste et son image en Occident de l’Antiquité à l’époque contemporaine (In the mirror of posterity: the emperor Augustus and his image in the west from Antiquity to the modern era). 26th-27th June 2014 – Colloquium in the Auditorium of the Grand Palais, Paris: Auguste en mots. Le princeps au miroir de la littérature. 23rd October 2014 to 15th January 2015 – Exhibition at the Musée Saint-Raymond, Toulouse: Célébration du bimillénaire de la mort d’Auguste. 20th to 22nd November 2014 – Conference at the Institut de Recherche sur l’Antiquité et le Moyen Âge, University of Bordeaux: Auguste et l’Asie Mineure. 5th to 8th March 2014 – Conference at the Katholische Akademie in Bayern, Munich: Augustus. Zum 2000. Todestag (Augustus at the 2000th anniversary of his death). 14th October 2014 to 10th February 2015 – lecture series at the Freien Universität, Berlin: Modellkaiser – Kaisermodell. Ringvorlesung zum 2000. Todesjahr des ersten römischen Kaisers Augustus (Model emperor, emperor model. A series of lectures on the 2000th anniversary of the death of the first Roman Emperor, Augustus). 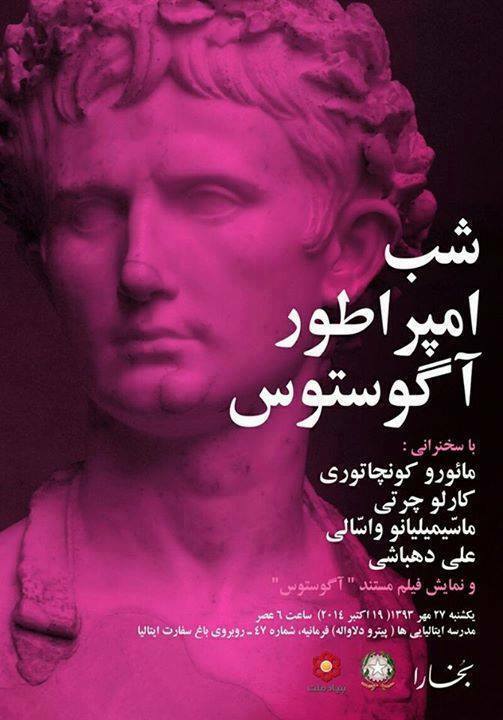 19th October 2014 – Evening of talks at the Italian embassy in Tehran. 12th-14th June 2014 – Conference at Trinity College Dublin: The Augustan Space: A Bimillennium Celebration (Rome AD 14 – Dublin 2014). Autumn 2014 – Part 1 of the lecture series, Italy’s Golden Ages, organised and hosted by the UCD Foundation for Italian Studies. 18th October 2013 to 9th February 2014 – Exhibition at the Scuderie del Quirinale in Rome: Augusto: details in Italian; details in English. October to December 2013 – Series of talks associated with the exhibition, Augusto at the Palazzo delle Esposizione: details in Italian; details in English. 18th January 2014 – Guided visit to the Crypta Balbi, Rome. 25-26th January, 7th February and 28th March 2014 – Visit to Rome and two talks organised by the Nola branch of the Archeoclub d’Italia. January to May 2014 – Series of guided visits to Rome with GEA archeologia. 22nd and 23rd March – free visits to the Forum Augustum, Mausoleum of Augustus and Theatre of Marcellus as this year’s Giornate FAI di Primavera is dedicated to Augustus on the occasion of his bimillennium. 21st April to 21st October – multi-media projections and an audio commentary recreate the Forum Augustum as it was 2000 years ago in regular evening displays. Details in Italian; details in English. 25th April to 7th September 2014 – exhibition at the Ara Pacis Museum: L’arte del comando. L’eredità di Augusto (The art of command. The legacy of Augustus). Details in Italian; details in English. 3rd-4th May – Painting workshops for adults and children. 30th June to 3rd July 2014 – Conference at the Notre Dame Global Gateway, via Ostilia: Texts and Monuments in Augustan Rome. 19th August 2014 – Extra visitor attractions and special events at archaeological sites and museums across Rome: press release. 19th August 2014 – Special show, Ara Pacis a colori (The Ara Pacis in colour) at the Museo dell’Ara Pacis. 19th August 2014 – Special guided visits to the Mausoleum of Augustus. 30th-31st August 2014 – Performance in the Mercati di Traiano: Tyrtarion. 8th September 2014 – Official opening of new parts of the ‘House of Augustus’ and ‘House of Livia’ on the Palatine hill after restoration works: article in Italian. 12th September 2014 – Official opening of new facilities at the Antiquarium of the Villa of Livia: article in Italian. 19th September 2014 – symposium Augusto e Roma, 2000 Anni Dopo (Augustus and Rome, 2000 Years Later) at the Consiglio Nazionale delle Richerche. 23rd September 2014 – Opening of the Italian part of the Keys to Rome project at the Museo dei Fori Imperiali nei Mercati di Traiano. This exhibition continues to 12th April 2015. More details here (in Italian). 24th September 2014 – Official opening of a reconstruction of the Acts of the Arval Brethren and the Ludi Saeculares at the Terme di Diocleziani: article in Italian. 1st October 2014 – Reopening of the Vicus Iugarius through the Basilica Julia after restoration works: article in Italian. 24th-25th November 2014 – Conference at Roma Tre University: Imperia, the Mediterranean space from the ancient world to the contemporary age. Throughout 2014 – Walking tours of Augustan Rome with IFgift. Funding has been announced for a long-standing project to restore Augustus’ Mausoleum and integrate it more effectively into the Piazza Augusto Imperatore. Work is now scheduled to begin this year. Article in Italian; article in English. July 2012 – Photogrammetric and laser survey of the Arch of Augustus at Susa. 24th March to 15th September 2013 – Exhibition at Formia in Lazio: Formiae: una città all’inizio dell’impero (Formiae: a city of the early empire). 19th December 2013 to 2nd March 2014 – Exhibition and associated series of talks at the Museo Civico Archeologico ‘O. Nardini’, Velletri: L’ascesa della ‘gens Octavia’: da banchieri a imperatori (The rise of the gens Octavia: from bankers to emperors). January and February 2014 – Series of talks, guided tours and readings in Velletri: Celebrazioni Augustee Bimillenario XIV – MMXIV. 13th February 2014 – Velletri and Nola officially twinned. 20th February to 5th November 2014 – Programme of talks and guided tours, Pisa. 21st February 2014 – Evening of talks in Brescia: Augusto e Brixia. 20th March 2014 – Afternoon of talks at the Cappella Farnese di Palazzo d’Accursio, Bologna: Sulle tracce di Augusto (In the footsteps of Augustus). 22nd-23rd March 2014 – Free visits to Augustan sites all over Italy as this year’s Giornate FAI di Primavera is dedicated to Augustus on the occasion of his bimillennium. 23rd March 2014 – Evening of talks at the Auditorium della Fondazione Cassa di Risparmio, Pesaro: Augusto in Oliveriana nel bimillenario (Augustus in the Museo Oliveriano at the bimillennium). 6th April 2014 – Morning of talks and archaeological site visit, Lecce. 12th April 2014 – Conference in Susa: L’arco di Susa e i monumenti della propaganda imperiale in età augustea (The Arch of Susa and the imperial propaganda monuments of the Augustan era). 25th April 2014 – Guided walk around the lago d’Averno, starting in Pozzuoli. 6th-10th May 2014 – Series of performances, workshops and talks in Velletri. 13th and 16th May 2014 – Activity days for school children at the “Filippo Corridoni” school, Fano. 15th May 2014 – Lecture in the Cultura del Comune di Fano: Fano e il bimillenario augusteo. 22nd-24th May 2014 – Presentation of school pupils’ work, day-long workshop and a theatrical performance, Venafro. 23rd May 2014 – Launch event for ‘Nunc est bibendum’, a series of Augustan bimillennial events in Perugia, at the Università per Stranieri. 12th-14th June 2014 – Settimana di Studi Aquileiesi in Aquileia, focusing on Augustus’ connections with Italy’s Regio X, Noricum and Pannonia. 18th-21st June 2014 – Conference at Gazzo Veronese near Verona: Symposium on the Age of Augustus. July-December – Programme of guided visits, exhibitions and talks in Ventimiglia. 6th July, 3rd and 19th August and 7th September 2014 – Guided tours and theatrical performance at the Museo Nazionale Atestino and Giardini del Castello, Este. 8th July 2014 – Historical re-enactments, Lariano: La Notte Augustea (The Augustan Night). 11th July 2014 to 11th January 2015 – A programme of exhibitions at the Villa Frigerj and the Palazzo de’ Mayo, Chieti: Secoli augustei. Messaggi da Amiternum e dall’Abruzzo antico (The Augustan centuries: messages from ancient Amiternum and Abruzzo). 15th and 18th July 2014 – Lectures over two evenings at the Civico Museo Pasquale Revoltella, Trieste: Augusto, Virgilio e il potere della parola (Augustus, Virgil and the power of the word). Part 1; Part 2. 20th July 2014 – Performance of Cesare Ottaviano Augusto by Paola Novara in the Amphitheatre at Ravenna. 22nd July 2014 – Theatrical performance at Grumentum: Pulcinella e l’Imperatore (Pulchinella and the Emperor). 25th July 2014 – Guided walk at Ventimiglia: Passeggiando con Augusto. 31st July 2014 – Lecture at the Museo Archeologico Castello di Torre, Pordenone: «…Se ho recitato bene, applauditemi!», part 1. 31st July 2014 – Guided visit to the Roman rooms of the Museo Archeologico, Padova. 3rd August 2014 – Concert performance under the Arch of Augustus, Aosta. 3rd-10th August 2014 – Extended opening hours and guided tours for the Pont d’Aël, Valle d’Aosta. 8th-19th August 2014 – Series of talks, workshops and performances in Caorle: 2000 anni in 5 giorni (2000 years in 5 days). 14th August 2014 – Guided tour of the Capitolium, Brescia, tracing the life and reign of Augustus and his local impact. 19th August 2014 – Public performances along the walls of Perugia: Notte di Augusto (Nights of Augustus). 19th-20th August 2014 – Special guided tours in Aosta. 21st August 2014 – Lecture at the Museo Archeologico Castello di Torre, Pordenone: «…Se ho recitato bene, applauditemi!», part 2. 22nd-25th September 2014 – European Summer School of Classics at the University of Trieste: Augusto. Le immagini, le parole, il potere. 11th-12th October 2014 – Two days of lectures and guided tours at Vicenza, Italy: Sulle Tracce di Augusto (On the Tracks of Augustus). Throughout 2014 – Series of talks, workshops, mini-exhibitions and events at the Rijksmuseum van Oudheden in Leiden. 19th August 2014 – Evening of food, drink, music, lectures and readings at the Rijksmuseum van Oudheden in Leiden. 29th October to 10th December 2014 – Public lecture series at the University of Leiden: Augustus – despoot of ideale heerser? Rome’s eerste keizer 2000 jaar na zijn dood (August – despot or ideal ruler? Rome’s first emperor 2,000 years after his death). 23rd September 2014 – Opening of the Dutch part of the Keys to Rome project at the Allard Pierson Museum, Amsterdam. 1st November 2014 – Conference in the Aula of the University of Amsterdam, Augustus en het Oosten: spoliis Orientis onustum (Augustus and the East: ‘laden with the spoils of the Orient’). Details available here soon. 10th December 2014 – Conference in Gniezno: August i Rzym: pamięć, rytuały i praktyki życia codziennego (Augustus and Rome: memory, rituals and the practices of everyday life). 6th-9th May 2014 – Conference in Lisbon: Augustus appelatus sum: tradition, rupture and memory. 19th July-30th September 2014 – Exhibition at the Museu de Numismática, Vila Real: ‘Augusto, Imperador‘. 10th-11th September 2014 – Congress in Braga: Celebração do Bimilenário de Augusto (Celebration of the Bimillennium of Augustus) at the Museu de Arqueologia D. Diogo de Sousa. 24th-26th September 2014 – Conference in Lisbon: XIV A.D. SAECVLVM AVGVSTVM: The Age of Augustus. Details in Portuguese; details in English. 16th January to 28th March 2014 – Series of talks at the Museo Nacional de Arte Romano, Mérida: Augusto y su tiempo: en el bimilenario de la muerte del emperador Augusto (Augustus and his time: at the bimillennium of the death of the emperor Augustus). 7th to 9th April 2014 – Conference in Madrid: La Hispania de Augusto. 24th-27th April – Two lectures and a historical re-enactment as part of the annual Festival Romà de Badalona. April to December 2014 – Series of cultural events across the province of Aragón: Año de Augusto (The Year of Augustus). An extensive programme of talks, workshops, exhibitions and re-enactments at museums and archaeological sites in Zaragoza, Velilla de Ebro, Tarazona, Calatayud and Huesca. 5th-25th May 2014 – Festival in Tarragona: Tarraco Viva: Espai August, a three-week themed festival celebrating Augustus and his connection with Tarragona. June to September 2014 – guided tours and family activity days at the archaeological sites and Museo del Teatro Romano, Cartagena: Augusto, 2000 Años Después (Augustus, 2000 Years Later). 16th-21st June 2014 – Summer course in Tudela: AUGUSTO, OPTIMI STATVS AVCTOR. Augusto y la reorganización del Principado, en su bimilenario (Augustus, author of the best constitution. Augustus and the reorganisation of the Principate at his bimillenium). 3rd-5th July 2014 – Summer course in Mérida: El siglo de Augusto (The Age of Augustus) at the Museo Nacional de Arte Romano. 4th July 2014 to 6th January 2015 – Exhibition in Mérida: Augusto y Emerita at the Museo Nacional de Arte Romano. 7th-9th July 2014 – Summer School of the Universidad del País Vasco: Augusto. Pasión de estado (Augustus: Passion of the state) at the Museo Romano Oiasso y Gordailua (Irun). 7th-18th July – Archaeology course run by the IE Universidad, Segovia: Arqueología y arquitectura de las ciudades romanas del valle del Duero (Archaeology and architecture in the Roman cities of the Duero valley). 10th July 2014 onwards – Exhibition at the Biblioteca d’Humanitats, Universitat Autònoma de Barcelona: Bimilenario de Augusto. 16th-19th July 2014 – Theatrical performance at the Teatro Romano de Itálica de Santiponce, Sevilla: Augusto: fortuna pública, dolor privado (Augustus: public fortune, private grief). 16th July to 9th August 2014 – Programme of talks and performances in Astorga. 28th July 2014 – Official opening of the restored Aula Sacra of the Teatro Romano de Mérida. 18th-24th August 2014 – Week of talks, historical recreations, exhibitions, workshops and more at Gijón: details in English; details in Spanish. 26th-29th November 2014 – International Archaeological Congress in Tarragona: August i les provinces occidentals 2000 anniversari de la mort d’August (Augustus and the Western Provinces, the 2000th anniversary of the death of Augustus). 15th, 16th and 22nd December 2014 – Seminar at the Museo de Almería: Mujeres en el Saeculum Augustum (Women in the Age of Augustus). Throughout 2014 – special spa treatments and dinners at the Balneario de Alange. 16th November 2013 – Teachers’ INSET day in Manchester: Augustus and his bimillennium: making the most of 2014. 1st March 2014 – City Lit Classics study day at the British Museum: Augustus and his World. 16th April 2014 – panel on ‘The Augustan (R)evolution’ organised by Clare Rowan at the Classical Association Conference, Nottingham. 26th June 2014 – Talk by Penny Goodman at Leeds City Museum as part of the Classics in our Lunchtimes series: ‘2000 years of Augustus: the world view’. 12th-17th July 2014 – JACT Classical Civilisation and Ancient History summer school at Repton School, Derbyshire. Includes a talk by Alison Cooley on ‘Assessing Augustus AD 14-2014’ on Tuesday 15th July. 26th-31st July 2014 – Association for Latin Teaching INSET Summer School for Latin Teachers at St. John’s College, Durham. Culminates with ‘Augustus Day: 2000 years since Augustus’ death’ on Thursday 31st July. 18th to 20th August 2014 – Conference at the University of Leeds: Commemorating Augustus: a bimillennial re-evaluation. 19th August 2014 – Augustus family activity day at the National Roman Legion Museum, Caerleon. 23rd September 2014 – Talk by Adrian Goldsworthy at the National Roman Legion Museum, Caerleon: ‘The Emperor Augustus and LEG II AVG’. 31st October 2014 – Evening discussion with Prof. Andrew Wallace-Hadrill and Dr. Ingo Gildenhard at the Museum of Classical Archaeology, Cambridge: ‘Augustus and the rebuilding of Roman identity‘. 1st November 2014 – Joint Association for Roman Archaeology and Roman Society colloquium: Augustus, first emperor of Rome. 12th February 2015 – Evening lecture by Penny Goodman in Hull at the Graduate Research Centre, Hull University: ‘On this day in history: Augustus at his bimillennium‘. 3rd May 2014 – Spring Meeting of the Classical Association of Massachussetts at Westwood High School: All Things Augustus. 19th August 2014 – Evening talk at the Commonwealth Club, San Francisco: Augustus is dead! Latin is not! 22nd August 2014 – Evening talk at Shelter Island Public Library, New York: Emperor Augustus, on the Occasion of the 2000th Anniversary of his Death. 25th August 2014 – Evening conversation at McNally Jackson Books, New York: McNally Jackson & The NYRB Classics: Daniel Mendelsohn and Adrian Goldsworthy On Emperor Augustus. 3rd September 2014 – Two panel discussions at the American Enterprise Institute, Washington DC: From anarchy to Augustus: Lessons on dealing with disorder, from Rome’s first emperor. 2nd October 2014 – Evening discussion at Porter Square Books, Cambridge, MA: Daniel Mendelsohn and William Giraldi at Porter Square Books. 13th October 2014 – Evening talk at the Commonwealth Club, San Francisco: Emperor Augustus: a force for civilization. Holger Sonnabend (2013), August 14: Der Tod des Kaisers Augustus (Darmstadt: Primus Verlag). Review; interview with the author. Bruno Albin (2014) La Véritable Histoire d’Auguste. Adrian Goldsworthy (2014), Augustus: First Emperor of Rome. A new edition of John Williams’ novel, Augustus, first published in 1972, is published by NYRB Classics on 19th August 2014 in honour of the bimillennium: publisher’s website; introductory essay by Daniel Mendelsohn. Paideia has already published two special issues (67/2012 and 68/2013) of Miscellanea Augustana, and will complete the series this year with a third issue (69/2014). Hermeneus special issue, Augustus (86.2/2014). Focus Storia February special issue (88/2014). Roma Aeterna special issue, 2000 jaar Augustus: doorwerking en navolging van het ideaalbeeld van de Romeinse keizer. Storica National Geographic, Speciale: Augusto: la nascita di una nuova era (13/2014). Antike Welt special issue on the Death of Augustus (04/2014). Cambridge University Press are offering free access to a special selection of articles about Augustus in honour of his bimillennium. Coins at Warwick is running a series of blog posts on Augustan coinage. The Augustus Collection is running a series of blog posts on Augustus. The Universitat Autònoma de Barcelona has set up a website in Catalan about Augustus and his bimillennium. Commemorative €10 coin produced by the Italian state mint. Bimillenario Augusteo calendar for 2014 produced by Victrix Edizioni. Bimillennial T-shirt produced by Antigua Roma al Día. Keychain with a reproduction of an Augustan coin minted in Calagurris produced by the Amigos de la Historia de Calahorra, Spain (only available for sale locally). Special limited-edition Augustan cava featuring a bust from the Museo de Calatayud produced by Bodegas Langa, Calatayud, Spain. Hymn for the Ara Pacis by Erika Zoi. Les Belles Lettres are promoting a bimillennial selection of books on Augustus. The Librairie Guillaume Budé is likewise promoting an (even larger) bimillennial selection of books on Augustus. Cambridge University Press are offering 20% off four of their key publications about Augustus.